Plant update | Living life in the carpool lane..
At around Easter time, we planted flowers. It started off as two, but more trips to Target meant finding more of those little $1 plant growing kits. Preschool and “spring” also meant planting seeds and watching them grow. So now, we have seven plants. Let me correct that, we have seven pots of plants that we are tending to. As for the number of actual plants that are growing…. see for yourself. The two terra-cotta pots were the two flowers we started with. That big plastic cup holds marigolds from M’s preschool class. The rest are supposed to be tomatoes, cilantro, basil, strawberries and green peppers. Unfortunately, I forgot to put labels down as I planted them. So whatever decided to grow will be a total surprise to all of us! 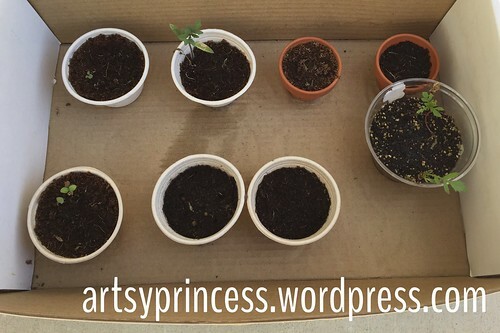 Out of the seven pots shown above, only FOUR seem to be growing. 3 Responses to "Plant update"
Bean seeds tend to grow quick! Oh, ok! Thanks! Definitely will try that next year.